Running an interactive workshop for children. 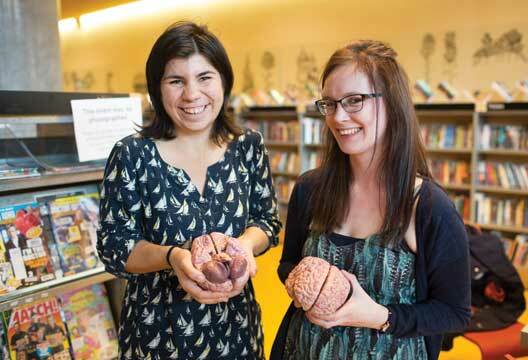 Stacey Bedwell (Lecturer in Psychology at Birmingham City University) and Isabelle Butcher (Doctoral Researcher in Psychology at the University of Manchester) recently ran an interactive workshop for children and their parents at The Library of Birmingham as a satellite event to the biennial British Neuroscience Association Festival of Neuroscience. We spoke to them about the experience. Stacey: I had written a children’s book, How Does My Brain Work?, exploring the human brain from a variety of perspectives in an accessible and engaging format. So BNA organising committee member Daniel Fulton approached me, saying he envisaged an event that would enable a wider audience, particularly children, to become involved in the festival. Isabelle: As a psychology researcher, I hoped to provide an ideal complementary example to Stacey’s biological background, covering the wide range of applications in brain science and different ways in which children can aspire to careers involving the human brain. How did you engage young children in such a complex topic? Stacey: With over 100 audience members of varied ages and backgrounds, it was a challenge! Our workshop included topics such as what the brain looks like, what different brain regions are involved in and how neurons are connected. Isabelle: We felt it was important to have multiple interactive elements, including a popular demonstration of a neural network akin to the playground game Chinese whispers. I think we managed to convey complex ideas in a way that the children could relate to and could take away and think about further. Stacey: Once the workshop had formally finished, most children and their parents/guardians stayed behind and asked us additional questions relating to their brain, and other children simply wanted to share with us the information about the brain that they already knew! It was exciting to talk to the audience on an individual basis and to see their interest at such a young age. Why are these events important? Isabelle: By presenting seemingly complex topics in fun and exciting ways it encourages children as well as adults to understand more of science and what it entails! It is far too easy to conduct the research in the laboratory or other research environment and write it up in journals, without disseminating the research to members of the public – whether that it is through workshops to children or through engagement events for older members of the public. Stacey: It’s vital that researchers engage with the public at every stage of their career. And there’s something in it for the researcher too: having the rare opportunity to engage with a young audience in a less formal setting than most academic meetings or conferences gave us a unique insight into the importance and excitement of inspiring young minds. It has encouraged us to get involved with scientific outreach projects with school aged children on a larger scale. I’d go as far as to say it’s renewed enthusiasm for our own research projects, and reminded us why we do scientific research.